The Asheville School for Boys, renamed the Asheville School when it became coeducational in 1972, was one of the first boarding college preparatory schools in North Carolina. An outgrowth of the University School of Cleveland, Ohio, the nation's first country day school, the Asheville School was founded by Newton Mitchell Anderson and Charles Andrew Mitchell, who had also founded the University School. Opening with 50 students in the fall of 1900, the Asheville School was, like its forerunner, distinctive in the way it combined classical studies with manual training-thus preparing boys to attend any college or technical school in the country. The school prospered until the mid-1920s, when financial difficulties led to its sale to a Pittsburgh resident who sought to change the school's orientation (and did change its name to the Asheville School for Training in Christian Leadership). However, in 1933 a group of alumni led by trustee chairman Philip R. Clarke raised $350,000, bought the school, and returned it to its original college preparatory curriculum. As the years passed the school expanded its mission, first admitting day students and then girls in 1972. The Asheville School-named to the National Register of Historic Places in 1996 and passing its centennial in 2000-enrolled about 218 students in the early 2000s, including 111 females and 107 males, most of whom boarded on the 300-acre campus of the school. Annual fees for tuition, room, and board were more than $26,000. Milton Ready, Asheville: Land of the Sky (1986). 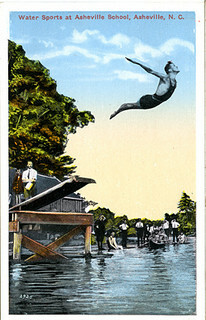 Water Sports at Asheville School, Asheville, NC Published by Dr. T.C. Smith Co., Asheville, NC. From the Georgia Historical Society Postcard Collection, c. 1905-1960s, NC State Archives, call #:PhC45_1_Ash176. Available from http://www.flickr.com/photos/north-carolina-state-archives/4818977228/ (accessed September 17, 2012). 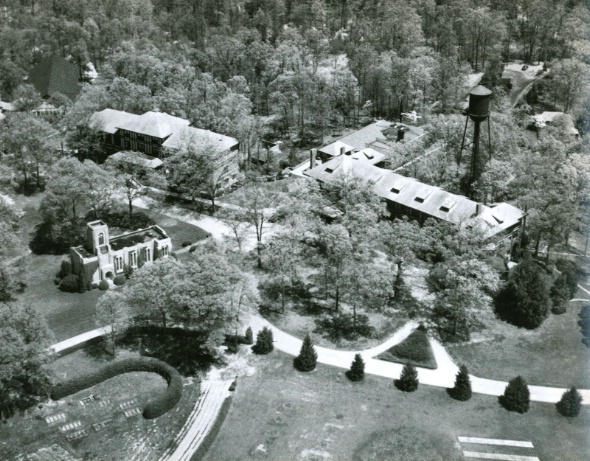 Aerial view of campus in 1940. Image from the Asheville School: http://www.ashevilleschool.org/gallery/index.aspx?ModuleID=50&LinkID=12 (accessed September 17, 2012).